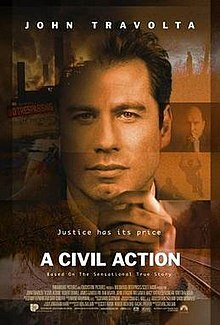 A Civil Action is a 1998 American legal drama film directed by Steven Zaillian and starring John Travolta (as plaintiff's attorney Jan Schlichtmann) and Robert Duvall, and that is based on the book of the same name by Jonathan Harr. Both the book and the film are based on a true story of a court case about environmental pollution that took place in Woburn, Massachusetts, in the 1980s. The film and court case revolve around the issue of trichloroethylene, an industrial solvent, and its contamination of a local aquifer. A lawsuit was filed over industrial operations that appeared to have caused fatal cases of leukemia and cancer, as well as a wide variety of other health problems, among the citizens of the city. The case involved is Anne Anderson, et al., v. Cryovac, Inc., et al.. The first reported decision in the case is at 96 F.R.D. 431 (denial of defendants' motion to dismiss). Duvall was nominated for an Academy Award for his performance. It is a fine film. An excellent cast. Very well-shot and scored. An interesting and topical story told with class. Steven Zaillian has not directed a film since the colossal failure of All the King's Men in 2006. Hopefully his success with HBO's The Night Of entices him to try his hand at it again. 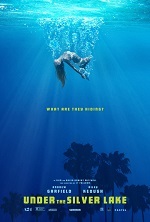 Thought this was great, it has a real ensemble cast and the story is fascinating and dramatic. It's quite unique in where there isn't the standard protagonist wins and justice is served, instead the truths of reality, practicing law and trials are straight forwardly at the forefront. To some extent it feels the film struggles a bit making a Hollywood film with a not very Hollywood resolution to the actual case. Although there is more justice closure to it, which we get informed about at the end. Travolta shines in a role in his prime, he just had a great 90's, I feel his voiceover added the right dynamic to the film as well. Duvall also stands out as the experienced opposition's lawyer, and there's many other recognizable faces like Lithgow, Gandolfini and H.Macy to appreciate in their roles. In addition, the score is a star in the film, especially in the beginning, setting an engaging mood. 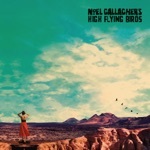 It's slickly directed and I just enjoyed all aspects of this.